Tooth loss—whether one or several teeth—can lead to a number of difficult situations, ranging from eating and talking to an impaired sense of self-confidence. Therefore, Dr. Makram recommends replacing your missing teeth as soon as possible. Of course, there a few options when it comes to tooth replacement. You and Dr. Makram will decide whether dentures or dental implants are the best choice for you. 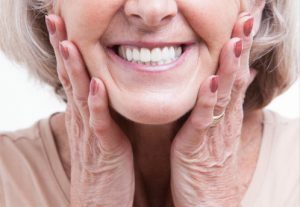 Dentures are removable oral appliances that are designed to replace all of the teeth and some of the gum tissue along an entire arch. Dentures are made of false teeth, also called pontics, which are mounted on a gum-colored base. They are held in place by natural suction and a special denture adhesive if necessary. Partial dentures are used to replace a few missing teeth when you still have some of your natural teeth. With clasps and brackets, a partial attaches to surrounding teeth, so the false teeth fill the gaps in your smile. A dental implant is a tooth replacement that actually consists of two parts. The first is a titanium post that implant dentist Dr. Makram surgically embeds in your jawbone. This post replaces your missing tooth root. As such, it fuses with surrounding bone tissue to become the anchor that will hold your tooth replacement, which can be a porcelain crown for a single tooth, a crown and bridge for several consecutive missing teeth or even implant supported dentures if you are missing all of the teeth along one arch. Deciding whether dentures or dental implants are right for you depends on several factors, not the least of which is cost. Dentures are more affordable than implants, especially if you need to replace several teeth. Moreover, dentures do not necessitate a surgical procedure whereas dental implants do. Of course, dentures do not offer the sense of stability that dental implants offer. Dentures can slip when you’re eating or speaking—an embarrassment you won’t have to worry about with dental implants. And with implants you won’t have to contend with facial sagging that often happens to denture wearers, because dentures only replace teeth and not the roots that stimulate healthy new bone growth—the key to maintaining your natural facial appearance. If you would like to meet with Dr. Makram to discuss your tooth replacement options, then schedule a consultation today. We treat patients from Naples, FL, as well as Bonita Springs, Vineyards and Golden Gate area.